Can I Invest Self Managed Super Fund In Property Development? Can I Invest My Self Managed Super Fund In Property Development? The ATO has property development for SMSFs on its radar for 2018! Previously, the ATO has been sending some mixed messages about property development involving an SMSF. So, is property development an allowable investment for an SMSF? The short answer yes, but be careful! The longer answer is: be very careful — you may easily trip up and breach one or more rules. The ATO is keeping an eye on this and will scrutinise any fund using property development. The first problem you face is that in operating a property development you will likely be engaging in a business activity. While the law does not specifically prevent an SMSF from operating a business, the ATO has been very clear that while it may be allowed, it is frowned upon due to the possibility of the fund straying from operating for a “sole purpose”, and will likely lead to greater scrutiny. The next problem you face is the trust deed. Most older trust deeds would not have envisioned running a business and even some newer ones as well. The law is very clear that the trust deed must specifically allow for this — mere silence on the subject is not enough. Therefore, have your trust deed reviewed and updated if necessary. This is a legal document, so you will need to get a lawyer to look at it or get a commercially available one. A superannuation fund is specifically prohibited from providing non-retirement benefits to members and related parties. The legislation prevents a trustee of an SMSF from providing financial assistance to members or relatives of members. Therefore, if a member of the fund or a relative (possibly including “associates”) receives a benefit from the fund in the form of payments towards the costs of the development, there is the potential for there to be a breach of compliance requirements. Financial assistance will not be deemed to be provided if the member or a related party is paid market rates, however, if underpayment is charged then there is likely to be a form of financial assistance that breaches the rules. You must also consider the requirement that prima facie prohibits an SMSF from acquiring assets from related parties. This becomes very difficult for a fund when engaging a related party to undertake the development. 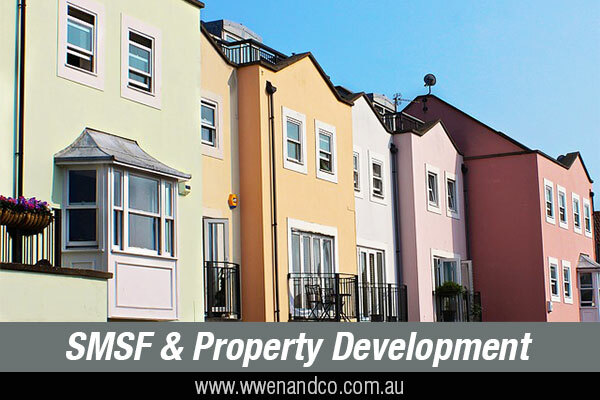 The SMSF rules permit the payment to a related party for “services” related to a property development but prohibit building materials to be bought from a related party as these are assets of that related party. One solution to this is for the SMSF to enter into an “agency” or “reimbursement” agreement with the related builder that states that the builder is not buying the material for themselves (and therefore becomes their asset) but on behalf of the SMSF. Again, this must be crafted properly, and you can still run into the problem of the “arm’s-length” requirements. Even where your dealings with related parties are permissible, they must always be at arms-length prices. Part of the reason for doing the development in-house rather than getting an external provider may be that it is hopefully cheaper to do so. However, if payments are under or over market prices, then there will be a breach of these requirements. Therefore, it is important that such transactions are well documented, and that proof exists of payments at market rates (it may be a good idea to get third-party quotes as proof). When dealing with property development at non-market rates there is another potential issue to contend with — payment considered to be a contribution. The relevant legislation says: In the superannuation context, a contribution is anything of value that increases the capital of a superannuation fund provided by a person whose purpose is to benefit one or more particular members of the fund or all of the members in general. Therefore, where services are provided below market value this will in effect increase the capital of the SMSF, and can, therefore, be considered a contribution. The ATO also made it clear in the past that where a related party improves an SMSF asset at no cost to that SMSF, for the purpose of benefiting the fund, this will constitute a contribution reflective of the increase in market value of the fund’s assets. So, is it really possible for SMSF to engage in property development? However, given the turn in market prices recently and the increased vigilance of the ATO, make sure you get good advice before taking this on. Review your trust deed. It must specifically allow for running a business. If it does not, update it. Review your investment strategy. Is property development allowed? Is it in accordance with the risk profile of the fund? Does it benefit all the members? Talk to this office about the right structure for your fund entering into a property development. Keep everything at arm’s-length and at market value; there are many pitfalls here so be very careful. Don’t purchase directly from a related party, and make sure any related builder is buying on behalf of the SMSF or the unit trust. Beware of borrowing rules as costs may blow out. Finally, document everything. The ATO has this on its radar, so expect greater ATO scrutiny if you engage in property development through your SMSF.